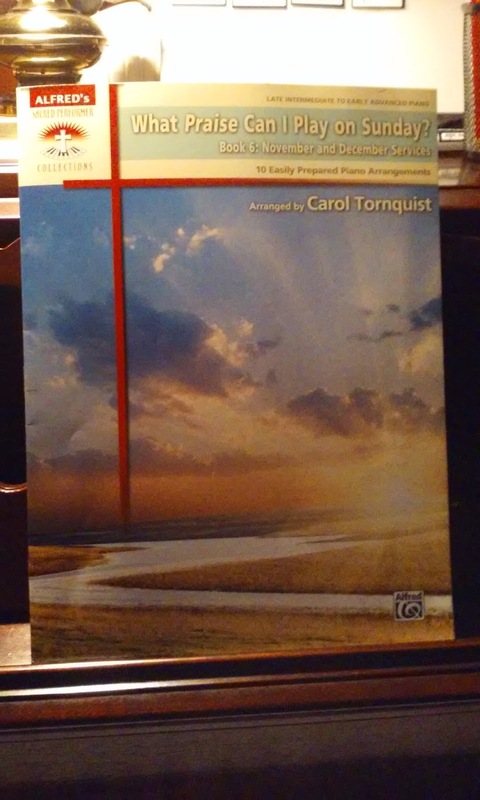 In addition to privately teaching piano, I also serve as a church music director.When my son and I were shopping yesterday, I found a book of arrangements in a bookstore called What Praise Can I Play on Sunday? Book 6: November and December Services arranged by Carol Tornquist. My son was being cantankerous, so I briefly scanned the list of titles and the pieces inside, tossed it in the cart, and did not look at it again until much later that night. Later, as I played through the arrangements, I knew that I had found a wonderful resource for the upcoming months. 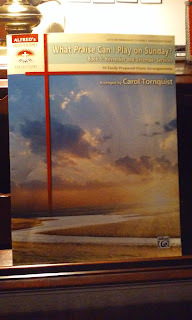 Carol Tornquist has written tasteful interpretations of well-known contemporary pieces or praise songs, and, even though they are contemporary, they are written in such a way that traditional congregations (such as mine) will enjoy hearing them, as well. Each arrangement comes with details about its length (helpful in determining whether to use the piece for a prelude, offertory, or postlude), and suggestions on which Sunday the piece would work well. For example, All the Earth Will Sing Your Praises is recommended as a Christ the King Sunday piece. For me, one of the challenges of being a part-time music director is finding enough time to practice, especially on top another job and learning all of the other music that is necessary for a church service. It is important that books of arrangements are easy to prepare and that most of the pieces within the book will be practical for Sunday morning. Some books look useful in the store, but when brought home, it becomes apparent that only one or two out of twelve pieces will be serviceable. It can be expensive to purchase book after book, only to use a few arrangements from them. I know that I will be able to use every arrangement in What Praise Can I Play on Sunday? and I definitely plan to purchase the other books in the series to add to my library. I highly recommend this book to any church pianist looking for a great service music resource.